Once you have downloaded Courtside, there is an initial set up process. NOTE: You must have an internet connection to complete this process. 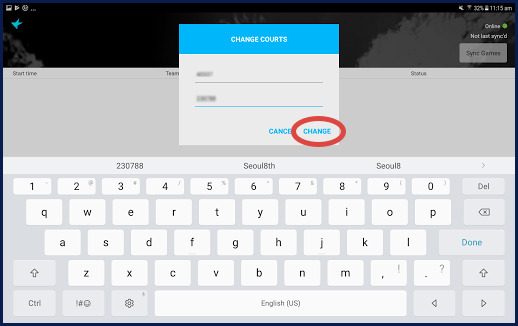 When you enter Courtside for the first time, you are prompted to enter a Court ID and Setup ID. These are unique to your venues and are necessary to ensure the correct games are downloaded. Tap on the line to activate the keyboard. Enter the Court ID and the Setup ID and click Change. Choose the current date from the date picker. Dates with competition are displayed with a green dot below them. This will display the list of competitions available for the venue. 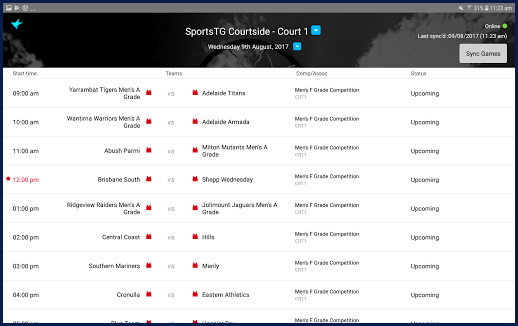 NOTE: the Court ID and Setup ID can be found in the SportsTG Competition Database. Please see the articles below to know the process. How to find Court Id? How to find Setup Id? If you are an association, please contact The Basketball Network Support Team at basketball.net.au/tbnsupport.